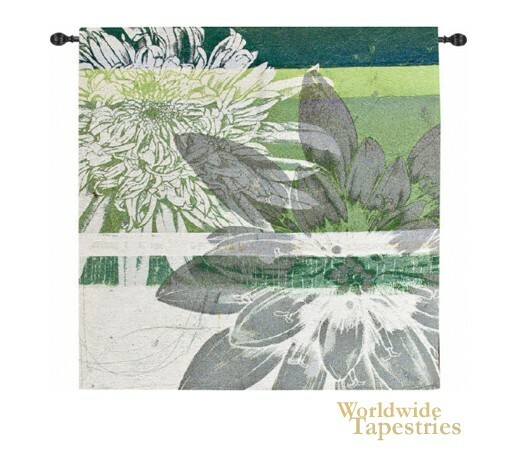 Graphic Blooms I tapestry shows a modern floral abstract work in greens. Here in this work we see flowers in full bloom in a light and emerald green background. Modern in feel, this tapestry brings the beauty of flowers to the indoors in a contemporary way. Like its companion piece "Graphic Blooms II" this work shows a work taking the traditional inspiration of flowers in art, to a modern version. Graphic Blooms I tapestry is lined and has a tunnel for easy hanging. Dimensions: W 40" x H 40"